This matching and memory game can be played on your own or with a friend. You will need to print out and cut out the cards from this sheet. The aim of the game is to match pairs of cards which have the same time interval. 2. The first player turns over one card, then another one. 3. If the cards match (i.e. if they show the same time interval), that player takes them and has another turn. If the cards do not match, the cards are turned face down again. 4. The second player turns over two cards in the same way and takes them if they are a pair, or turns them over if they are not a pair. 5. Players take turns to turn over two cards at a time in this way. 5. The game ends when all the cards have been matched into pairs. 6. The winner is the player who has taken more pairs of cards. Alternatively, you could use a scoring system - see the instructions for playing with one player below. 1. 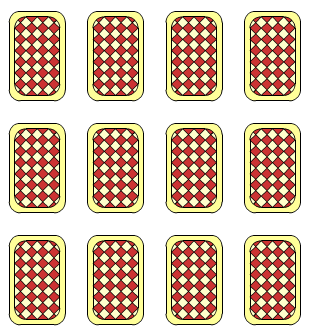 Layout the cards face down in a rectangle in the same way as above. 2. Give yourself 100 points at the start of the game. You may need to write this down! 3. Turn over one card, then another. 4. If the cards match, add 50 points to your score and remove them. If the cards do not match, subtract 10 points from your score and turn the cards face down again. 5. Turn over two cards again and repeat step 4. 6. The game ends when all the cards have been matched into pairs. Try again - can you beat your previous score/s? Working systematically. Investigations. Addition & subtraction. PrimaryGames-Measures. Combinations. Games. Time. Visualising. PrimaryGames-Number. Interactivities.